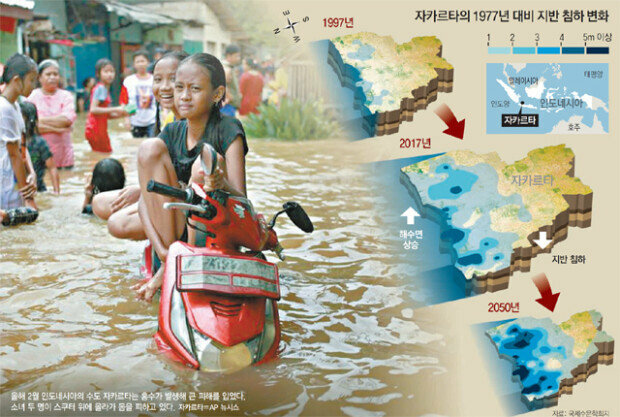 Research: North Jakarta will be entirely submerged by 2050. August. 18, 2018 07:15. kyungeun@donga.com. The Jakarta Palembang 2018 Asian Games is set to begin in Jakarta, Indonesia, on Friday. The 2018 Asian Games are being cohosted in two cities for the first time in its history, Jakarta and Palembang. While this is the first time that Palembang, capital of the South Sumatra province, hosts the games, the Indonesian capital of Jakarta was yet again chosen as a venue in 56 years since 1962. Unfortunately, however, the 2018 Asian Games may be the last edition ever held in Jakarta as the city is sinking at an alarming rate, with half the city expected to disappear into the ground in 30 years. The Indonesian capital of Jakarta, with an area of 661.5 km², is the largest city in Southeast Asia, located on the northwest coast of the Java and home to 10 million people. The size of the city’s area and population is similar with that of Seoul, but its elevation is 7.92 meters above sea level, only one-fifth of that of Seoul (38 meters). Moreover, bounded by the sea and with 13 rivers flowing through the city, Jakarta is subject to frequent natural disasters such as typhoon, tsunami, and flooding. Still, climate change is not the only factor that is worsening the situation of Jakarta. Another source of trouble came from excessively extracting ground water to spare expenses for building water purification facilities. Pumping water from the aquifers with the depth of 40 to 140 meters has made the ground sink. The city is finding itself in a dilemma with rising sea levels and sinking ground.